There are signs that the shutdown has had a negative impact on activity. The pace of expansion in the services sector decelerated in January. The ISM non-manufacturing index fell to 56.7 in January from 58.0 in December, reflecting concerns about the government shutdown, which negatively impacted new orders. Fed chairman Jerome Powell said that the economy remains in a good place and has proved resilient to shocks such as Brexit, citing low unemployment and inflation that is close to the Fed’s 2.0% target. US lawmakers are making progress toward funding the portion of the US government that has not yet received appropriations for the rest of the fiscal year. A physical barrier along parts of the US southern border is included in the package. US stocks moved modestly higher, helping most of the major indexes record their seventh consecutive weekly gain. Within the S&P 500 Index, utilities shares performed best, followed by the larger industrials and information technology sectors. Energy stocks fared worst as oil prices drifted lower. Market volumes were muted for much of the week despite 100 of the S&P 500 companies releasing quarterly earnings reports. The Cboe Volatility Index (VIX) hit a five-month low on Wednesday before rising a bit at the end of the week. US president Donald Trump announced Tuesday during his annual State of the Union address that he plans to meet with North Korean leader Kim Jong Un in Vietnam beginning 27 February. In the speech, Trump welcomed North Korea’s cessation of nuclear weapons and missile tests, as well as the return of US hostages held by North Korea, but said much work remains to be done. In the US, there could be another government shutdown from 15 February if President Trump and Congress do not agree on a budget. US Treasury Secretary Steven Mnuchin and Trade Representative Robert Lighthizer are travelling to China next week to continue trade negotiations. Due to the government shutdown, data releases from the Census Bureau and Bureau of Economic Analysis are still lagging. With negotiations between the United Kingdom and European Union dragging on, it now appears unlikely that the two sides can reach an agreement that can be ratified by the British Parliament by 29 March, if at all. While EU negotiators have publicly stated that there will be no renegotiation of the withdrawal agreement, there were reports this week that the EU may offer the UK political assurances (lacking the force of law) that it will offer a detailed proposal for a technological solution to the Irish border impasse, although it is thought that such a plan would be difficult to pass in Parliament. Tensions flared between the two sides this week when European Council president Donald Tusk said that there is “a special place in hell” for British politicians who campaigned for Brexit without a plan. The most important event this week is the Brexit vote in the House of Commons on Thursday 14 February. While the next ‘meaningful vote’ on a full Brexit deal has been postponed, as PM Theresa May and the EU27 have agreed to continue negotiations in late February, this is an indicative vote. May will deliver a statement to the Commons, which the MPs will vote on and which is amendable. This gives the MPs another opportunity to force PM Theresa May to ask the EU27 for an extension of Article 50 (the fact that May promised another vote next week was one reason why the so-called Cooper amendment failed last time). British employers cut the number of staff they hired through recruitment agencies last month for the first time since July 2016, according to a survey of recruiters that adds to mounting evidence of business caution ahead of Brexit. The permanent jobs placement index in the monthly KPMG/Recruitment and Employment Confederation (REC) Report on Jobs fell to 49.7 from 53.7, below the 50 dividing line between growth and contraction for the first time since just after 2016’s referendum on leaving the European Union. As widely expected, the Monetary Policy Committee (MPC) of the Bank of England (BoE) decided to keep the policy rate unchanged at 0.75%. The QE programme was also unchanged. The decisions were unanimous. The BoE sees lower global growth than in the Inflation Report from November, pointing to softer data from China and weaker indicators in the US. It is more focused on the fall in equity markets than the recovery. Also, it has taken note of widening non-financial corporate bond spreads and that wholesale bank funding costs have risen. Domestically, the BoE seems even more worried about the Brexit problem. It mentions that UK economic growth slowed in late 2018 and appears to have weakened further in early 2019, stating greater effects from Brexit uncertainty at home as a major culprit. The preliminary Q4 GDP growth print are due out on Monday, which is expected to be +0.3% quarter-on-quarter (+0.1% month-on-month in December). The growth picture has become weaker, as Brexit uncertainties are weighing on investments and global growth has slowed. In its quarterly report, the European Union (EU) said that eurozone growth is expected to slow significantly this year because of weakening global trade, the slowdown in China, and uncertainty stemming from Brexit. The EU reduced its 2019 growth forecast to 1.3% from 1.9% and said that it expects growth of 1.6% in 2020. The EU also cut Italy’s growth forecast to the lowest level in five years, citing the populist government’s fiscal policies that led to high borrowing costs and market uncertainty. The news caused a sharp spike in Italian bond yields. EU stocks pressured by trade worries and signs of eurozone slowing with the pan-European STOXX Europe 600 Index slightly lower on the week amid fresh trade worries sparked by President Trump’s remarks that he had no intention to meet with Chinese leader Xi Jinping before 1 March trade deal deadline. Weak data also underscored the extent of the growth slowdown in the eurozone and its largest economy, Germany. January’s new car registrations numbers are due on Friday. 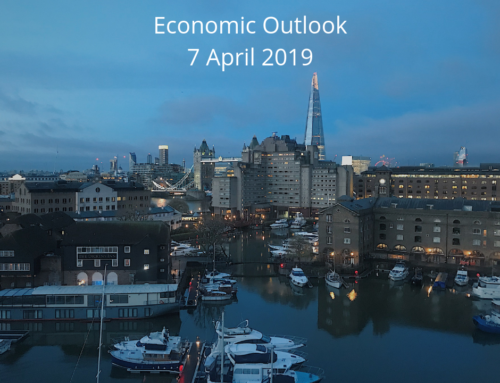 Bottlenecks in the car sector have been one of several Achilles heels for the euro area economy in Q4 and a continuing rebound in new car registrations will be welcome news for the economy. Markets have been boosted of late by hopes that the US and China will reach at least a partial deal to end their standoff on trade. Those hopes faded a bit late in the week on word that US president Donald Trump and Chinese president Xi Jinping are not likely to meet when Trump is in Asia later this month to meet with North Korea’s Kim Jong Un. It is thought that the leaders will only meet if a deal is close to being finalised. Nonetheless, US negotiators Robert Lighthizer and Steven Mnuchin are heading to Beijing next week to continue talks, so there is still time to pull a deal together or extend the negotiating window beyond the 1 March deadline set by the US, thus avoiding triggering a hike in US tariff rates from 10.0% to 25.0%. White House economic adviser Larry Kudlow said that there is still a pretty sizable distance in the position of the two sides as they seek to reach an agreement. Turning to Europe, fears are growing that the US and the EU will reach an impasse on autos, a major European export to the US, since the EU refuses to negotiate the opening of its agricultural market to the US. On 17 February, the US Department of Commerce is expected to deliver a report on the national security implications of US auto imports. The president would then have 90 days in which to take action. Trade balance for January, CPI, PPI and FX Reserves are due this week. There was a big drop in imports and exports in December and expect January to be weak as well before a gradual recovery sets in. Focus in the inflation data will be on the producer prices, where PPI inflation is likely to drop further to 0.6% year-on-year in January from 0.9% year-on-year in December. CPI inflation is expected to continue hovering around 2.0%, still far from the 3.0% target. FX Reserves should not attract much attention as the CNY has strengthened recently. Sources: T. Rowe Price, Reuters, MFS Investment Management, Danske Bank, TD Economics, Handelsbanken.